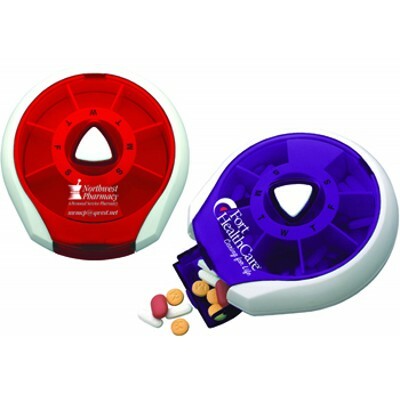 This promotional pill dispenser is an innovative pill dispenser that rotates a daily dosage of tablets, caplets or capsules to an easy open compartment. Dispenser cover detaches for easy refilling. Colour: Tropi-cool Translucent in Blue, Red, Pink, Frost, Purple, Aqua. Item Size: 90.5mm (L) x 87.3mm (W) x 30mm (D). Decoration Type: Pad Print. Decoration Size: 31.8mm (L) x 25.4mm (W). This product is currently unavailable until further notice. Price includes: 1 col print, 1 pos. Price includes Setup.